I am using the Tessel board on my WIndows 7 64 bit system. I executed npm install -g tessel without any problems. I only see the Power LED light-up on the board. Now I can see the Error and the Comm LEDs flashing. 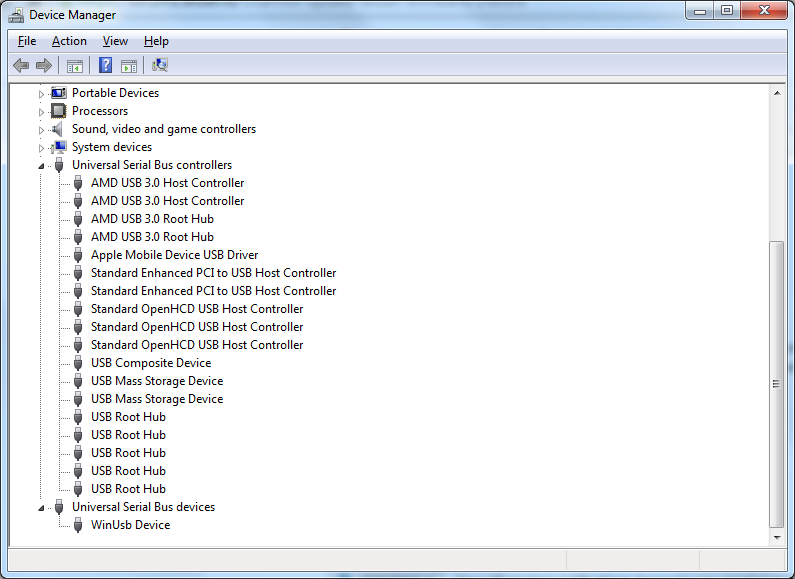 When I plug in the Tessel into the USB port of my PC I see a message indicating that the Windows USB device driver has been installed successfully. 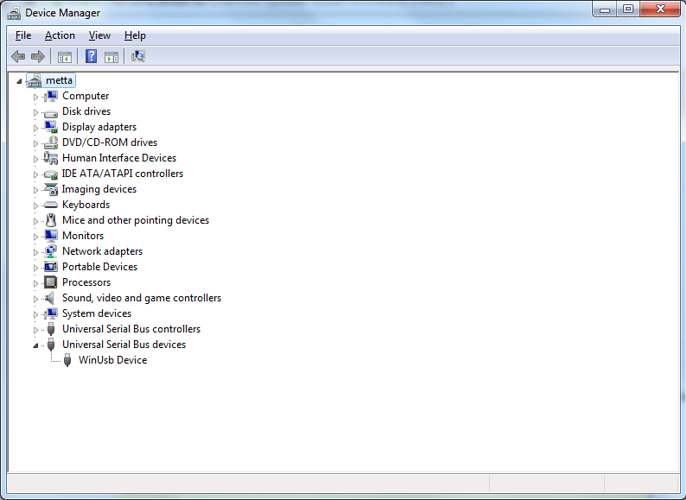 In Device Manager I see the WinUsb device listed under Universal Serial Bus devices. Let me know if there are any suggestions to resolve this issue. I Have the same setup and it works fine. Did you also try to update npm itself before proceeding to Tessel installation? I updated to the latest release of node.js : v0.12. I also see that there are no files in C:\Users\amit\AppData\Roaming\npm. Looks like the tessel package installation has been messed up. Any way to clean this up ? 64 win32-ia32 darwin-x64 || node-gyp rebuild'. @Amit_Mookerjee, Tessel doesn't support Node 0.12 yet. Could you give it a try with Node 0.10.x? INFO No driver installation necessary. 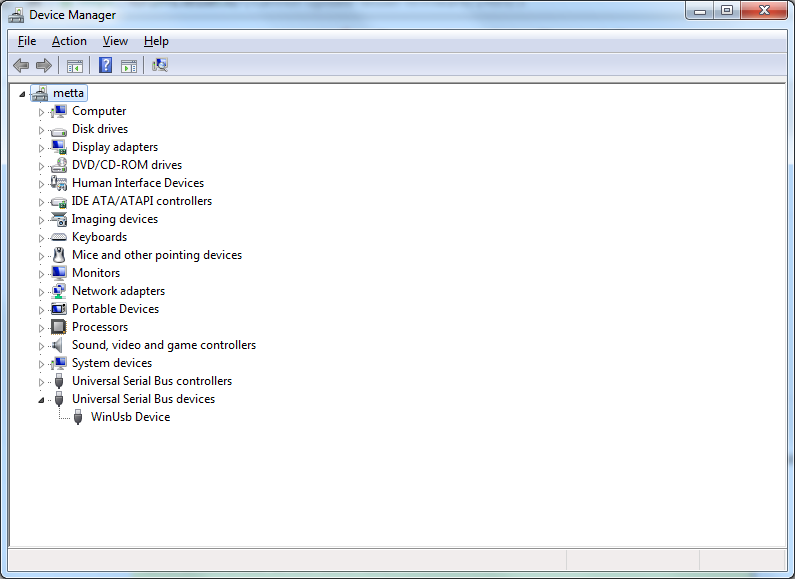 When I plugged in the tessel board I got a message from Windows that the USB driver got installed successfully. 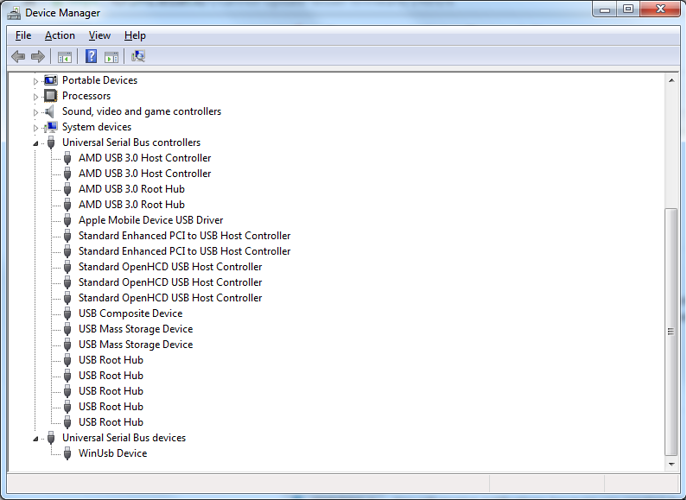 @Amit_Mookerjee, if you right click on "Universal Serial Bus controllers", what do you see? Do you have any venders are NEC or Renesas, you'll need to update the driver by finding the update on your PC Manufacturers website. I have a HP Pavillion PC and I have installed the latest driver from the HP website. Is there a way to test the integrity of the Tessel board itself ? Hi @Amit_Mookerjee, a simple visual test is to look at the LEDs. If you see some partially lit, it means the bootloader was not loaded on to the device. However, since you see a device register under the USB devices node, I think that's unlikely. Have you tried using Zadig to bind the device to the WinUSB driver? Zadig did not make any difference as well. However I could use Tessel from my Mac without any problems which indicates that this is a Windows driver issue. Any other creative ideas to get Tessel working on Windows as well ? [ 0.180011] [0000184c] liERR! No devices found. Try updating to the latest version of the Tessel CLI, and make sure npm ls -g usb shows node-usb@1.0.4 under tessel@0.3.21 . That version of node-usb includes this commit which is required for compatibility with your AMD host controller. How do I get access to tessel v 0.3.21 ? npm update -g tessel worked. Now I am able to make progress with my development.